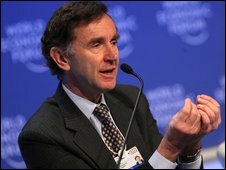 HSBC chairman Stephen Green has said that the current financial rules must be "fundamentally revised" as they had deepened the financial crisis. The rules, such as capital adequacy regulations and fair value accounting, were "well intentioned", but had proved to be inadequate, he said. Some say that these rules encourage banks to build up their capital instead of lend money to their customers. HSBC is one of the few big banks that did not need to seek government loans. "We do see value for our proposition... in being a clearly independent, international bank," Mr Green told the Reuters news agency at the World Economic Forum in Davos. Fair value accounting is used to determine the value of assets whose market price cannot be determined. Capital adequacy rules set the levels of capital required by banks and other financial institutions. "Fair value accounting has added considerable volatility to results, only part of which is economic, and the capital adequacy regime... has hobbled many banks with spiralling capital requirements just when customers need them to be flexible with lending," Green said in a press release. Meanwhile, Barclays chairman Marcus Agius, speaking in Davos, hailed the UK government for supporting its banking system. Many analysts have expressed concerns about the government's shares in banks. 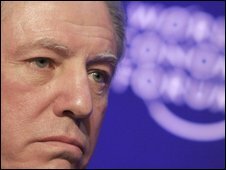 Mr Agius said at the World Economic Forum: "In time the shares will be returned to the market." HSBC's Green also said that "over time, state intervention that has taken place as part of the recapitalisation of various banks will gradually be rolled back".